By the conventional polling and political measures, President Vladimir Putin ought to be the most relaxed figure at the G8 summit meeting in Ireland. If he wanted to, he might look straight at the cameras and tell the world he shares their opposition to starting another war in the string of wars the NATO alliance has already lost in Afghanistan, Iraq, and Libya; and is now threatening in Syria, Lebanon, Iran, Turkey too, not to mention Mali. 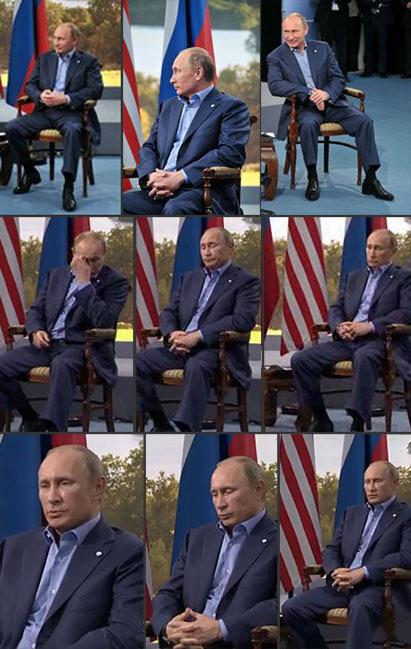 Instead, Putin displayed an unusual set of body signals rarely seen at events like these, or at his bilateral meetings with the same set of characters. Was he nervous, irritated, or plain angry? Right now Putin is one of just two figures at the Irish summit with an approval rating above 65%; his next election date is years further off than the others; he is the only one whose approval rating has remained stable above 62% for more than a decade. He has seen off last year’s street opposition; nobodies announcing their flight to Paris are one-day wonders on Radio Liberty, Liberation, and the Guardian. By contrast, Barack Obama’s rating is 45% and falling sharply. David Cameron’s is 31%; Francois Hollande’s is 29%, up slightly since it hit an unprecedented low of 25% in May. Angela Merkel’s rating ahead of the September elections in Germany varies between 60% and 68%. By these measures, the Syrian War party of Obama, Cameron and Hollande are the nervous ones, desperately trying to divert public attention from their political weakness, ward off party putsches, and rally extra-parliamentary support for a fresh round of regime change and killing abroad. Putin’s stance ought to be relaxed, even if the London papers have been reporting the attempt by Cameron to corner Putin into signing a communique on Syria with loopholes former President Dmitry Medvedev once fell for over Libya. According to the Kremlin’s favoured diarist of such events, Kommersant’s Andrei Kolesnikov, Putin is indeed relaxed. The Kremlin selection of photographs has also included smiles and loose hands to suggest the same message. The subscript is that by agreeing to “push” on Syrian President Bashar al-Assad to attend a peace conference (to which Assad has already agreed), Putin has extracted from Obama the undertaking not to pre-empt the negotiations with the start of heavy weapons flows to the Syrian opposition. The implication is that Obama has removed the chemical warfare claim against Assad as the trigger for escalation of US, British and French military intervention, as well as air attacks from Israel. This has already drawn the countermoves – Iranian regular forces and Lebanese irregulars to retake Syrian ground lost to the Anglo-American forces, plus a Russian missile screen to deter no-fly zone tactics and aerial attacks by US or allied aircraft. That in turn has produced threats from the American war party to attack Russians head-on. Look again at the visual signals before interpreting what ironies the two men intended. Russia, along with Putin’s domestic standing, are being directly threatened by American, British and French policy in Syria. From the Russian point of view, this is provocation, intended not only for regime change in Damascus, but regime change in Moscow through making Putin look vulnerable to renewed opposition. Putin’s bluff is being called. To deter escalation to a multi-front war, Putin decided to show anger in his face, hands, and feet. That’s the Russian warning that the counter for provocation is pre-emption. Do Obama, Cameron and Hollande want to start a shooting war with Russia?